Antoanella (Ismanescu ’96) Calame found herself in some tight spots before she left Romania, her birth country. Now, as often as she can, she gets others out of danger. A highly trained physician, Calame owns a practice in San Diego diagnosing disorders of the skin under a microscope. 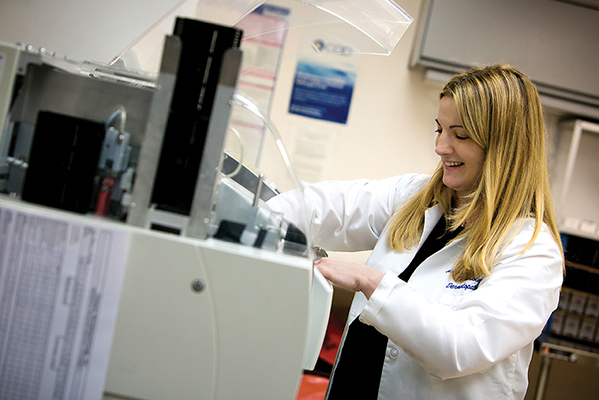 She employs more than 30 people, trains medical residents and owns the building where Compass Dermatopathology has two floors of labs and offices. She lectures and publishes, has won medical school teaching awards and is affiliated with Scripps Memorial Hospital in La Jolla. She also works directly with patients as a dermatologist, with past experience performing Mohs surgery to precisely remove cancer without harming healthy tissue. Samples arrive daily for her team at Compass to stain, fix and analyze. Calame started the business after seeing a need for faster turnaround times. She developed a time-saving process for logging the results of analysis, in which samples are matched with thousands of coded diagnoses. Skin doctors and skin pathologists have life-saving skills. They get called into dramatic situations. They see emergencies that others miss. They stage rescues. The thing is, that was the first time in six years of doctors’ visits he’d been correctly diagnosed. The man had gone through plastic surgery, biopsies and changing treatment plans, often on the assumption that the wounds covering his whole scalp were from horrible sun damage. He came in saying he was ready to kill himself. During the same visit, Calame and others determined that the man needed a high-potency topical steroid, that is, a cream. Two weeks later, the skin on his scalp was clear and he could begin to recover his well-being. In a case this year, Calame was called on as a second opinion to look at a biopsy from the forearm of a 5-year-old boy. A top East Coast medical center had labelled it a myeloid sarcoma, which was devastating news. But as his doctor and parents were discussing a bone marrow biopsy to see precisely what kind of leukemia he had, Calame phoned to inform them that he had nothing to worry about. Instead, the boy had “an absolutely harmless, self-limiting, self-resolving growth that requires no treatment.” He was misdiagnosed partly because the laboratory had checked only the slide, and not inquired about the young patient’s general health. Calame’s world changed in December of 1989 when she was 18 and beginning her university career in the western cultural capital of Timisoara. The small town girl from Deva, in the region once called Transylvania, found herself right where the Romanian Revolution was starting. By the time students went home for winter vacation, it was clear that the mostly bloodless revolution – one in a wave that year crossing Central and Eastern Europe – was rapidly succeeding and that Ceausescu and the government would indeed fall. On Christmas Day, the dictator and his wife were executed on national television. Almost immediately, young Ella started thinking about how to get to America. From one side, the United States had been a fantasy home for her as long as she could remember. Romania, apart from the government and the steady diet of propaganda, was a wonderful place to grow up, she said, but America still “epitomized everything you couldn’t have.” From the other side, she was convinced that the Communists would retake power in a matter of months. A few years earlier, around the time she began high school, her neighborhood got its first satellite dish; everyone tapped in and promptly started singing ’80s hits in English. She caught up with her dream country’s culture, temporarily deciding that she didn’t care for Madonna because too many others did. In a world where no one held a passport and everyone got by on rations of eggs, milk, electricity and hot water, this was freedom. Satellite programming made America into “a real place with real people” for Calame and converted the fantasy of escape into something she could see herself pulling off. So after Ceausescu’s death, when Romanian authorities stopped caring who left the country, she got her first passport and started applying for a U.S. student visa. Suddenly, she says with a laugh, the problem for people who wanted out was that no one wanted you in. Calame struggled to win the student visa because she had no intention of ever returning to Romania and also no intention of lying about this to the kind, blue-eyed American official who spoke such good Romanian. She would have been starting the rest of her life with that lie. Over the course of one year, she was interviewed three times by the same official, who finally granted her wish. After transferring to Cal Lutheran, she took science courses almost exclusively and graduated as the Class of 1996 co-valedictorian with a degree in biochemistry and molecular biology. The day before we first spoke for this article, Calame had seen a patient transferred to Scripps because of a rare drug eruption, or rash. Not surprisingly, other doctors didn’t know that the drug reaction could be fatal, and none of them had ever administered the intravenous medication needed right away to control it. Another save. “They’re always so surprised when it’s derm that does it,” she said. Dr. Calame assists Cal Lutheran’s Science Initiative as a Commission for the Sciences member.